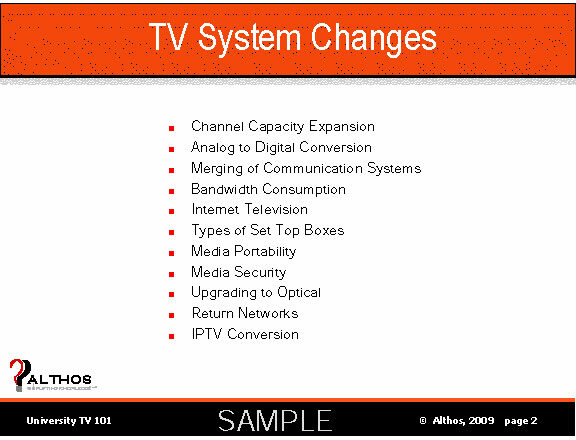 Channel Capacity - Many campus TV systems are already offering hundreds of channels. Even 1000 channels are not enough to provide the specialty programming that campus students and faculty want. Analog to digital - Campus TV systems are migrating from variable quality analog signals to constant quality digital programs. Merging Communication Systems - Because TV systems are merging with Internet and telephone systems, there is a “Who is In Charge?” challenge. Bandwidth Consumption - Bandwidth consumption is dramatically increasing and with a new TV multimedia, it will continue to increase. For example, 3DTV can use up to 60 2 Mbps streams - 120 Mbps per user! Internet TV - Some students are watching live TV through the Internet. They can do this on common devices such as XBox or Playstations. Media Portability - Students want to be able to watch TV in Living room, transfer to iPhone. Media security - Content owners want ways to control and protect media. Optical - Most campuses have some optical distribution and not types of optical are the same. Return Networks - May need to be a different network. IPTV - The holy grail of TV. Requires many new skills including HW, SW, and IT. This book explains campus TV systems, how they operate, and how they are evolving. Digital video (MPEG, AVC, VC-1) and audio (MP3, AAC) technologies are explained. Copper, coax, wireless and optical distribution systems are described. You will learn about digital rights management and how universities are upgrading to IPTV.